SDS announces list of demands, delivers letter to chancellor with 50 students in tow | Fight Back! Oshkosh, WI – On Mar. 5, more than 50 students participated in a march around the University of Wisconsin Oshkosh (UWO) campus which culminated in the public announcement of a list of demands developed by Students for a Democratic Society (SDS), followed immediately by the delivery of a letter containing the list to campus administration. Upon reading the final demand, SDS members led the students into Dempsey Hall, the administrative headquarters on campus, and up to Chancellor Andrew Leavitt's office, where they sought to hand-deliver the letter. However, as is frequently the case, the chancellor was unavailable to hear the grievances of the students. The letter was instead delivered to his chief of staff. The list of demands consisted first and foremost of a call for the immediate adoption of Sanctuary Campus status at UWO. In the fall semester, the Oshkosh Student Association (OSA) passed a resolution asking that campus administration consider such a move. 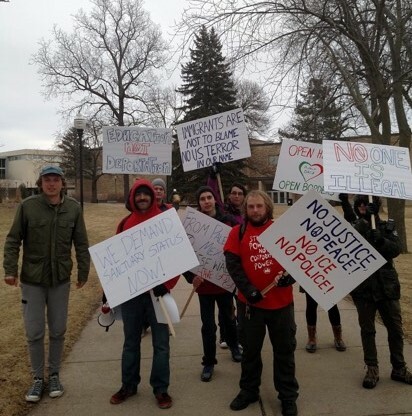 Despite some words of support, the chancellor ultimately decided that his political standing in Madison with the reactionary Walker administration meant more to him than guaranteeing the safety and security of undocumented students at his institution. As such, SDS decided to take up the call again to let Leavitt and his staff know that it will not just go away. Other demands included: calling for the creation of an all-oppressed nationality student representative body with wide-ranging authority and influence; an increase in the number of oppressed nationality faculty, and not just in cultural programs (i.e. Black faculty being mostly limited to African American Studies); an expansion of the number of cultural programs (i.e. Chicano/Indigenous/Asian/Arab Studies) and an increase in the number of non-Euro-American centered course offerings in history, music, art, philosophy, and other departments; greater resource allocation for cultural and gender studies programs and the facilities in which they are headquartered; mandatory social justice training for administration, faculty, non-faculty and student workers, volunteers and students at the beginning of every school year; and an increased emphasis on the part of administration to create a safe space for all oppressed and marginalized students. Included in the letter was a demand for a meeting with Chancellor Leavitt on Tuesday, March 27. The chancellor has a history of dodging meetings with SDS, but with the amount of support the organization gained as a result of this action, it is unlikely he will be able to do so quite as easily in the future.